I’m continuing our guided tour as part of the Craftalong today. 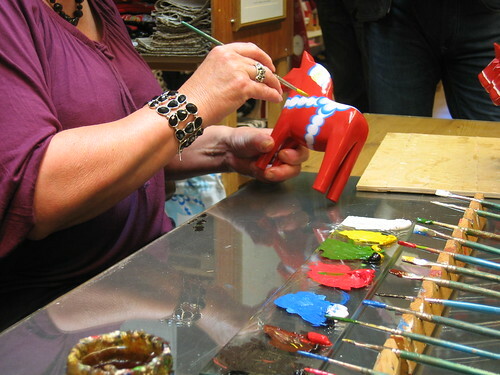 We are at Nusnäs, where the Dala Horse is created. I love the craftsmanship of the woodwork behind these horses, but today’s post will be a bit more colorful. 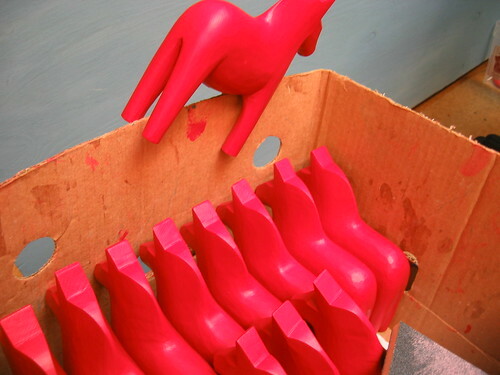 The Dala Horse is traditionally orange, but it comes in a varity of colours these days. I hope you’ll be inspired! The painting process starts after the wood have been carved and sanded. The entire horse is then dipped into a coloured lacquer. 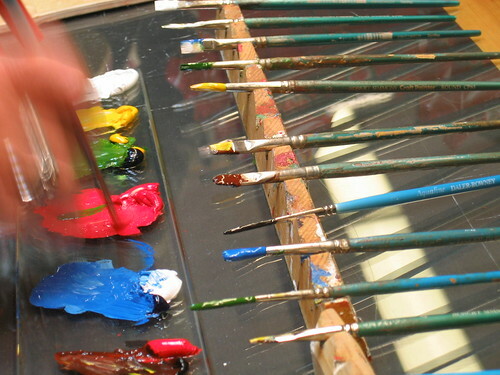 On that smooth surface professional kurbits-painters use oil paints. When we visited the shop in Nusnäs this lady was set up inside painting horses. She said that she has been painting horses for over 50 years, and you could tell by the speed of her hands. Wow! 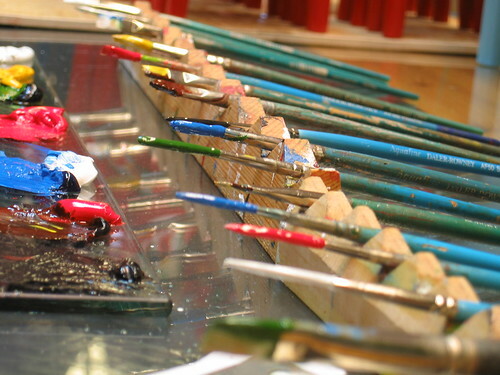 Paint brush set up with different colours. 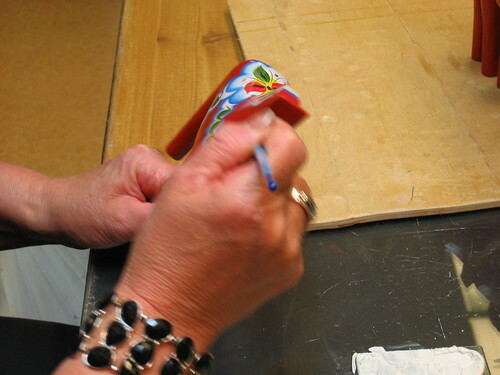 The pretty swirls on the Dala Horse is created by using two colours on the same paint brush. Perfect movement of the hand every time renders almost identical looking horses. If I hadn’t seen it I would think it was a printed pattern, but it isn’t. It’s a handicraft and a very cool one I think. Kurbits painting is a decorative style of painting that was very popular in Sweden between 1780 and 1870, particularly in Dalarna and southern Norrland. Today it is still used and a popular style that honour our Swedish, farmer herritage. This style is well-known as the style for painting Dalecarlian horses (from Dalarna). Kurbits are often big fantasy flowers with leaf bouquets, and garlands of flowers. I think kurbits can be fun when it is used in a modern context, then is becomes kitschy and playful. But it is definitely trending. Earlier this year a whole issue of a popular fashion magazine in Sweden had kurbits as a theme! One of my favorite interiour design blogs is a Swedish blog called kurbits.nu! 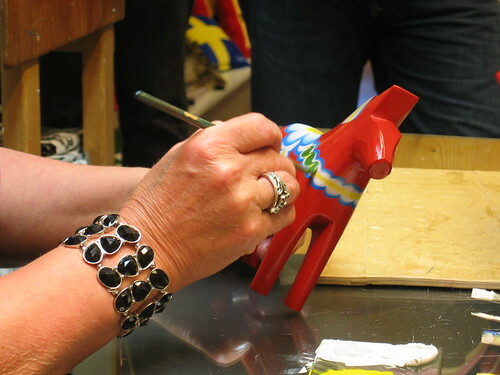 I hope you’ve enjoyed this little tour of the Dala Horse Making in Sweden! Please consider making your own Dala Horse and visit the other hosts of the Dala Horse Craftalong (me, Pam, Kathryn and Carina), they’ve got plenty of DIY craft inspiration for your Dala Horse Projects. Photos from the flickr pool! Add yours and let me know if you blog about it! It would be awesome to see if you make anything inspired by all of this. Thanks! 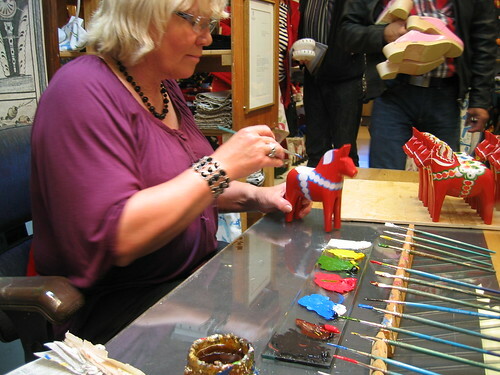 This entry was posted in Other's Creativity and tagged crafty business, dala horse, exhibitions, guided tour, souvenir, sweden, traditions. Bookmark the permalink. I’ve always loved Dala Horses. My mom has had a small one since I was a baby and I always loved looking at it. Maybe one day I’ll be lucky enough to buy my own in Sweden! These posts were really fun. Thanks for sharing this beautiful craft. Wow! I find the brush set-up fascinating! One brush for each color does make things easier! Love it! Oh Hanna! YOU are the BEST! I am sitting here completely enchanted. Seriously. I don’t know why these beautiful horses have such poser to enchant me but they do. And your most excellent posts of your factory tour – well I am sitting here grinning from ear to ear. Pure magic to get to enjoy an up close and personal visit. Thank you, thank you, thank you. I know i said that before – on your fist post but it bears repeating again! And I love the video! Seeing the whole process take place in less than a minute! And yet you get an appreciation for all the work that goes into each one. Did you see that tee shirt the carver was wearing? Now THAT is cool! I don’t wear tees much but I would wear THAT one every day! This settles it! When I move to Sweden, I will work in a Dala factory! Simply love the paintbrush holder.! This is so amazing! My family is Swedish and I think we have a few Dala horses somewhere. I like wondering about how the woman who paints got her job.. what sort of interview might she have had? These are so, so beautiful and knowing they are handmade every step of the way makes them so much more special. Thanks for sharing, lovely! Muy lindos los caballos de Dalarna, la felicito por preservar las tradiciones. Saludos desde Puebla, México. wow. I’ve always loved these horses but your post makes me want one right away. beautiful. Last year, I joined a lodge in California that promotes Swedish heritage and culture. In an effort to become more involved, I just became the newsletter editor. It seems that most of the posts I have read about the Dala are copied from each other so it is hard to find unique information. Would it be alright if I use your photos in an article I’m putting together for the newsletter? If so, please let me know which ones I am permitted to use. Thanks so much! I have a collection of Dala horses. I am of Swedish descent and love Swedish folk art. This was so interesting to me. Thank you! I hope it is OK if I pin your photo painting the horses on Pinterest. Hello there! Thanks for leaving a comment Merrilee! Pinning is okay, I appreciate if you add “Photo by iHanna” too, that means a lot to me. There is a Swedish bakery nearby. 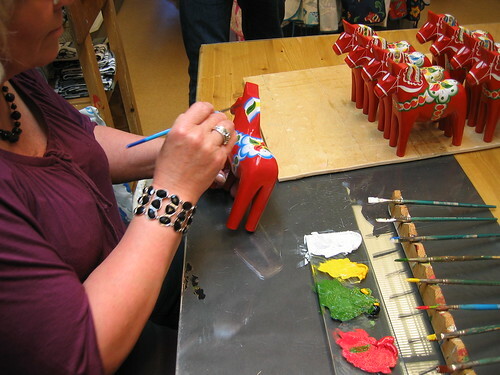 The shop is decorated with colorful dala horses. I love dala horses! The pastries are the best I’ve ever tasted. 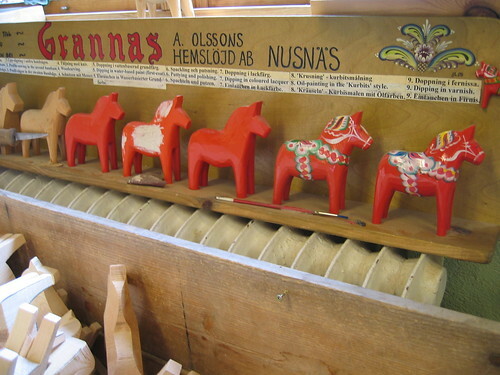 Hi Hanna, this is the best blog post about Dala horses I’ve had the chance to read so far !